Congratulations to Steven Tabb for taking the title of Event #11 Champion, along with the trophy and $52,126. Tabb also took down the $1,125 WSOP Circuit Event here at Foxwoods in August of this year. John Barucci shoved all in for approximately 900,000 and Steven Tabb quickly called. The board ran out [ah][8s][2h][5h][5s] eliminating Barucci in 2nd Place. Steven Tabb limped in the small blind, Sookha Kachittavong shoved all in from the big blind, and Tabb quickly called. The flop came [7s][6h][4c]. Tabb made a straight when the [5d] came on the turn. The [ah] river did not help Kachittavong, and he was eliminated in 3rd place. The final three players have come to the final chop deal. And they will play for the remaining $6,000 and the trophy. Steven Tabb shoved all in from the small blind and Brad St. Vincent quickly called for less in the big blind. Tabb was behind holding [8d][3h] versus St. Vincent's [6d][6c]. But that only lasted until the flop came [qc][jd][8s], when Tabb paired his eights. Unfortunately for St. Vincent the [ks] turn and [5h] river did not improve his hand and he was sent home in 4th place. After only a few hands coming back from dinner, Steven Tabb shoved all in on the button and Sookha Kachittavong called in the big blind. Tabb stood up from the table and said, "Ok, let's do this." The flop came [jh][8s][3h]. When the [3c] came on the turn, Tabb began to sit back down in his chair. The [10s] came on the river. Tabb is now sitting with 750,000. The final four players in Event #11 have just started a 60 minute dinner break. We will bring you updated chip counts before the start of play. On a board reading [js][4c][5d][8s], Jeffrey Giordano bet 300,000, Sookha Kachittavong shoved all in and Giordano said, "Well, it's good that I haven't snap-called." After a few moments of thinking it over he opted to call. Kachittavong had flopped a set of fives holding [5h][5c]. Giordano had a flush and straight draw holding [10s][9s]. Unfortunately for Giordano, the river came the [9d], and he was sent home in 5th place. Sookha Kachittavong raised to 80,000 from under the gun, Steven Tabb called on the button, and Randy Spain shoved all in from the big blind. Kachittavong tanked for a moment before he announced that he was all in for a bit over 2,000,000. Tabb folded his pocket tens face up saying, "Well, I guess I fold then." The board ran out [10h][qc][7s][2d][2h], sending Spain home in 6th place. "That's a tough spot, I may have to call in that spot," Brad St. Vincent said to Tabb who would have flopped a set of tens and won the hand had he not folded pre-flop. "Getting it behind obviously doesn't work for me," Spain said as he stood up and started walking away from the table. Jeffrey Giordano raised to 80,000 on the button, Steven Tabb shoved all in from the big blind, and Giordano called. The board ran out [qs][jh][9s][2h][ah] leaving Tabb with only 250,000 behind. Steven Tabb shoves all in on the button and is called by Randy Spain in the small blind. Tabb would need some help holding [kh][qs] against Spain's [ad][ks]. 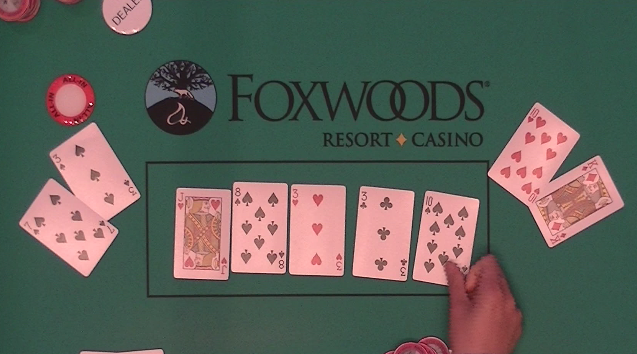 The flop came [7s][6h][ah] giving Spain the commanding lead with his pair of aces. The [jh] turn gave Tabb the heart outs, and the [8h] on the river would ensure him a full double up with his heart flush. Tabb is now sitting with 590,000. Steven Tabb shoved all in from the small blind. Randy Spain asked for a count and upon hearing the 274,000 total, Spain called. The board ran out [ks][jd][8c][jc][kd] giving Tabb a full house and a full double up. Tabb is now sitting with 720,000 and Spain with 1,350,000. Andrew Gileno announced that he was all in on the button. Steven Tabb folded his small blind, and Randy Spain asked for a count in the big blind. Upon heading the 225,000 total, Spain opted to call. Gileno was ahead holding [4h][4c] against Spain's [ac][10c]. But Spain flopped Broadway when the flop came [kc][qd][jd]. The [ad] turn and [7c] river did not improve Gileno's hand and he was eliminated in 7th place. Sookha Kachittavong shoved all in from the big blind and Jeffrey Giordano called in the big blind. The board ran out [9s][8d][4s][5d][7c] awarding Kachittavong a full double. He is now sitting with 800,000 in chips. On a board reading [10h][jh][ah], a player in early position bet 4,000 , Joe Starratt shoved all in, and the player in early position called. Starratt had flopped a flush holding [qh][9h] against his opponent's flopped straight holding [ks][qs]. The [9d] turn and [qd] river ensured Starratt the win, and his opponent was eliminated. Starratt is now sitting with 68,000 in chips at 300/600 blinds with a 100 ante. Solomon Yi shoved all in and was called by Jeffrey Giordano. The board ran out [js][jd][9c][qh][5h] sending Yi home in 8th place. Giordano is now sitting with 1,180,000 in chips. After a recent chop deal, it was Sherif Sweillam that would be the ultimate first place winner of Event #12. He will take home $7,000, the trophy, and the title. Sookha Kachittavong shoved all in and Jeffrey Giordano called. The flop came [7c][6s][2c], leaving Giordano in the lead. The [8s] on the turn gave Kachittavong the straight draw, and the [5d] gave him the straight and a full double. He is now sitting with 350,000. Andria Heyda shoved all in on the button for 32,000 and both Sherwin "The Fox" Agard called in the small blind as well as Sherif Sweillam in the big blind. Both blinds checked down the [ah][8d][4s][6h][2c] board. Heyda turned over [ah][qc], but "The Fox" showed [kc][ks] to eliminate Heyda in 5th place. Steven Tabb raised to 23,000 on the button and Randy Spain called in the small blind and Solomon Yi called in the big blind. When the flop came [ah][ks][8s], Spain led out for 75,000. Yi folded and Tabb called. Spain bet 150,000 when the [7c] came on the turn, and Tabb called. When the river came the [ad] Spain bet 200,000 and Tabb went into the tank. After a moment of thinking about it, Tabb folded [kd][8d] face up. Tabb is now sitting with 910,000, and Spain with just over 1,000,000. Brad St. Vincent opened for a raise and the General shoved all in. St. Vincent quickly called. The board ran out [kc][4d][js][jd][qc], sending the General home in 10th place. Sherif Sweillam raised to 40,000 in the cutoff and Harry Mozian shoved all in for 91,000 more in the big small blind. Sweillam called. The board ran out [ah][6h][2c][qh][9s], sending Mozian home in 6th place with a $2,163 payday.